Fly Tied By: Ed Laine, "Buxtehude"
Ed started trout fishing when he was seven years old and is now passing on his skills to his grandson and sometime fishing pal, Alexander McDonald. When Ed is not fishing the Carolina Smoky Mountains he works as a Manufacturer's Rep. The fly is named after the original source of the main ingredient of the nymph. 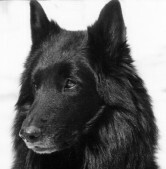 "Hassle", or more formally, Solarmarc’s Esprit de Hasselt, was a male Belgian Sheepdog (Groenendael, all black). The dog took no prisoners. He killed his first Orvis bed at four months; nailed a shutter salesman, a woman wearing a blinking light Christmas necklace and my now son-in-law who had the temerity to hold hands with my daughter at the dinner table. Jehovah’s Witnesses, Greenpeace, magazine peddlers, Seventh Day Adventists, UPS or postal employees were all prowlers on our turf to Hassle. Hassle was a character and we miss him and his strutting panache dearly. Hassle had fine, long black hair and a charcoal to reddish-gray undercoat. When he was brushed after a bath it fluffed like goose down….and, some of the blended mixture was saved for fly tying. With the DNA stored in that long black hair and fluffy gray undercoat, flies tied with it must harbor some lingering instinct, if only to protect the fisher from large marauding trout. Thus, the "Hassle Nymph" came to be. Its first day out it took a number of Big Hole rainbows and browns. In North Carolina a #10 black tungsten bead head Hassle Nymph took my largest trout in the Smokies, a 23" butter-bellied, hook-jawed brown. Tips: Pluck the underside of the fly with a bodkin to simulate legs. The individual hairs are fine and long and the fly gets even "buggier" looking with use. 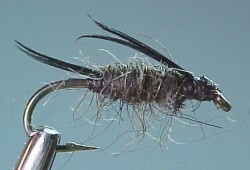 The fly may be weighted with lead wire, or tied in bead head style. (Gold, silver or tungsten black). It is a simple fly to tie. Getting the tail and wings even, to make it look balanced, is the only ticklish part…and I often wonder if that is even important to the fish.